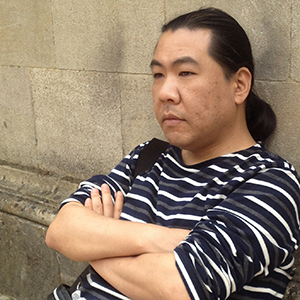 Hiroshi Tamawari, born in 1971, is a composer, a songwriter and a libretto writer, graduated from Keio University law department law subject, in other words he studied composition by himself. Tamawari dealt with libretto, composition, arrangement, the direction of the musical during university attendance period. Afterwards, he enter KONAMI as a sound creator, and composed, arranged and manipulated many games in charge of sound direction. He established an office of his own in 2002 and employed himself as freelance. Tamawari produces orchestral music mainly and lets the wide genre music including pop, rock, jazz, techno and folk music make crossover. He rather welcomes that he accepts your order with the limitation such as the kind of the musical instrument, melody tone, length etc., and he is good at the composition to match to the timing of a video perfectly. © TAMAWARI HIROSHI All Rights Reserved.